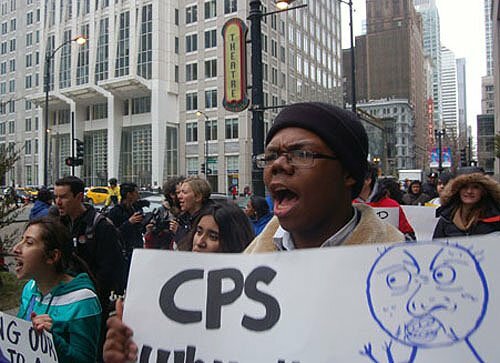 Rather than sleep late on their first day of spring break, several dozen Chicago Public Schools students marched on City Hall on Monday to deliver a letter protesting CPS plans to shut down 53 elementary schools and 54 schools altogether. 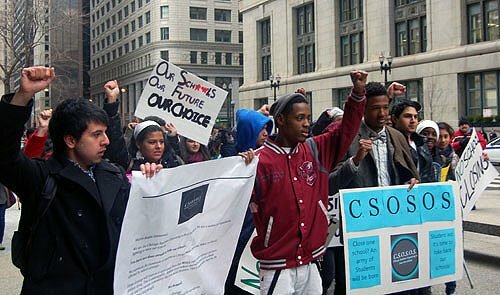 Protesters from Chicago Students Organizing to Save Our Schools, a newly formed organization of mostly high school students, held a press conference at CPS headquarters before delivering the letter. Stirgus said closing neighborhood schools would force elementary students, like his 12-year-old sister at Banneker Elementary in Englewood, to cross dangerous gang lines. Banneker is slated for closure with students being transferred to Mays Elementary next year. Bookended by media and police, the protesters carried the signed, oversized letter of demands from CPS headquarters three blocks through snow flurries along Clark Street to the mayor’s office. “Students united will never be defeated!” the student protesters chanted, falling back on the reliable pre-game cry “I believe that we will win!” duringl lulls. At City Hall, the protesters demanded a meeting with Emanuel as they pressed against rope barriers outside his office. With no one to receive them, the students read the letter aloud. “Rahm Emanuel, you have not done enough to help our schools,” they read in unison. “We demand an immediate moratorium on all school closings. “We expect to hear from you soon. If not, you should expect we’ll be back. This is our first action, but it won’t be our last,” the letter concluded. Eventually, Felicia Davis, a representative of the mayor's office, came out and the students presented the letter. Stirgus was proud of the organization's first protest. “We had a plan and executed that plan,” he said. Even if all 54 schools are shut down, Stirgus says the group will continue to fight for student voices. “We never stop,” he said. Clementine Frye, a senior at Lane Tech High School, said the protest was a success and a learning opportunity. She also plans to attend the March 27 CTU rally at Daley Plaza on Wednesday. “I learned that we as people have power in numbers,” she said.